A: Greg Barnes, Karin Wuhrmann, July 2003. A great finish to On The Lamb, Jailbreak heads up a golden knobby dike just before the end of On The Lamb (assuming you do On The Lamb in the “normal” left-to-right direction). Jailbreak follows the left-leaning dike all the way to the summit of Lamb Dome. 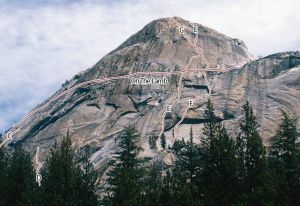 A short section up a dihedral past a bulge with a bolt leads to an anchor only 30 feet above On The Lamb, allowing climbers on Jailbreak to get out of the way of On The Lamb. The next pitch shares a section and the belay with the runout 3rd pitch of Sleeper, and the start of the last pitch of Jailbreak is also runout. Which SuperTopo guidebooks include a topo for Jailbreak?